A man was arrested by the authorities after trying to extort P20,000 from her bride-to-be. he told his future wife that he will not attend their wedding unless the bride gives him the money he was asking. Raul Domingo, 39, was arrested in a restaurant at Katipunan Avenue, Quezon City in an entrapment operation conducted by Criminal Investigation and Detection Group (CIDG) Quezon City. He was Arrested as he received the marked money given by her fiance, an Overseas Filipino Worker (OFW) who works as a music teacher in Singapore. Paula (real name withheld), 40, said that the suspect threaten him that he will not come to their wedding if she will not give him the money. After reporting to the authorities, she arranged her meeting with Domingo that led to his arrest. Investigation revealed that it is not the first time that the suspect asked money from her. The OFW confessed that she wanted to settle and have a family and she believed that Domingo will be her partner for life but it turned out that her fiance is an extortionist who only wanted her money. The CIDG conducts further investigation to find out if the suspect has other victims aside from Paula. 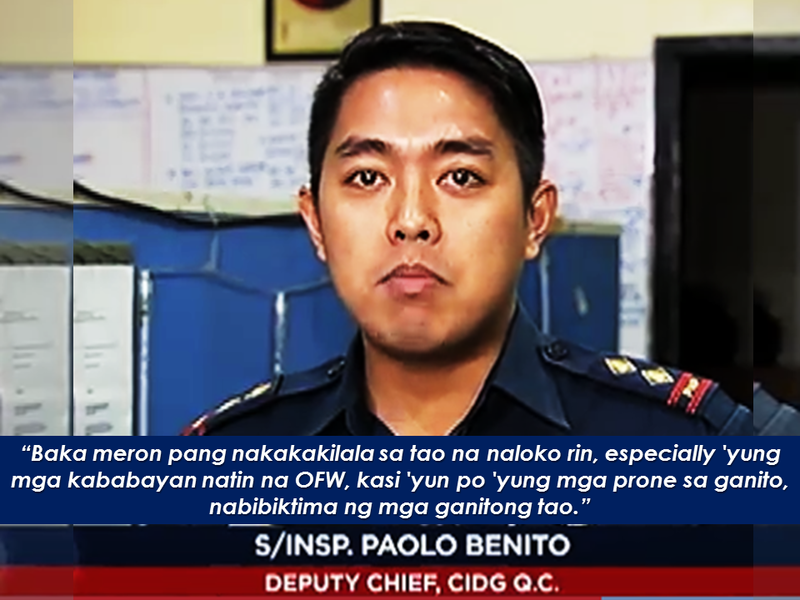 CIDG is looking on a possibility that the suspect is acting on a modus operandi that targets people especially the OFWs which according to them are most prone to these similar kind of swindling. Paula said they had been in a relationship for 5 months after meeting each other on a social media site. They already had their civil wedding and their church wedding is also set but after the civil wedding, the victim had no idea as to the whereabouts of the suspect. The suspects later contacted her via phone asking for the said amount of money. The suspects refused to make any statement. he is now facing robbery extortion charges as well as violence against women.